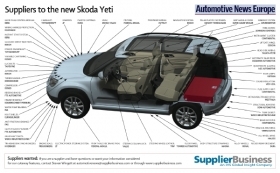 Skoda offers nine airbags on the Yeti small SUV, seven of them are standard equipment. The suppliers of the airbags include: Sweden's Autoliv Inc., which provides the passenger airbag; Takata-Petri, a division of Japanese supplier Takata Corp., which delivers the front-side airbag and the head-side airbag; and U.S. company TRW Automotive Corp., which supplies the driver, side and knee airbags. Continental AG regulates the deployment of the airbags with its control units and satellite sensors. BorgWarner Inc. supplies key components to the dual-clutch transmission mated to the Yeti's 1.2-liter 105hp gasoline engine. Skoda assembles the Yeti at its plant in Kvasiny, Czech Republic. Prices start at 17,990 euros in Germany. Skoda offers four trim levels, the entry-level Yeti E, Yeti S, Yeti SE and the top-of-the-range Yeti Elegance. The SUV, which debuted at the 2009 Geneva auto show, also has five engine options. ArvinMeritor Inc. is responsible for the Yeti's electric two-part panoramic sunroof, which is a derivative of the sunroof the U.S. supplier provides to the Volkswagen Golf. Skoda and VW are sister brands. ArvinMeritor produces the sunroof at its plant in Lozorno, Slovakia. The Yeti gets its off-road abilities from Swedish supplier Haldex AB and Canadian partsmaker Magna Powertrain Inc. Haldex provides its fourth-generation four-wheel-drive coupling while Magna Powertrain supplies its high-performance power-take-off units and rear axle drives.